Sometimes I surprise myself. This painting is one of those surprises. It was one of those rare pieces that felt like it painted itself. I don’t know how that happens so I never how to meet the conditions to replicate the experience. It’s very frustrating. There is a story about Sir Lawrence Olivier. He had just given an extraordinary performance as King Lear and he knew it. He went to his dressing room and proceeded to storm about the room in a rage knowing full well that he could never deliver a King Lear of that caliber again. The conditions for it could never be replicated. I’m no Olivier but I have a little understanding of the frustration he felt. Summer is waning but we are having some pleasant weather. The temperature is moderate and the humidity has fallen. This is our best weather of the year and my favorite time of the year. Summer’s growth has come to fruition and now Mother Nature puts on what I think is her best show of the seasons: the blaze of fall color. I will be going to Door County in the next few weeks. There is an abundance of sugar maples all over the county and spectacular color to go with it. 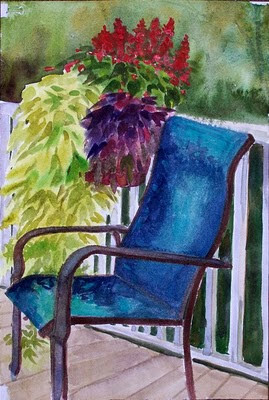 In the mean time I enjoy making watercolors on my deck. Otherwise this weekend I attended the Illinois State University Alumni Spectacular. 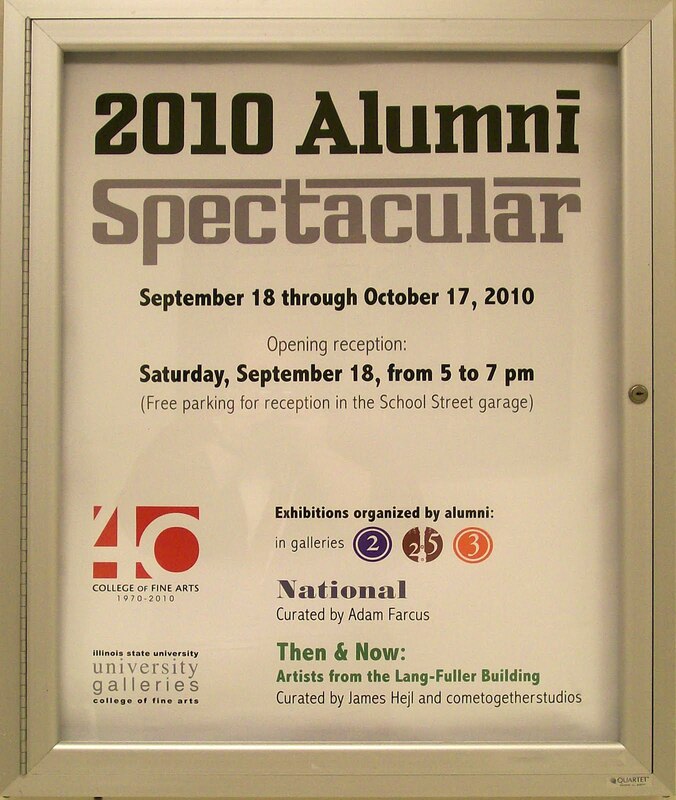 It’s the Fortieth Anniversary of the College of Fine Art and celebrate the University Galleries has mounted an alumni show open to anyone who has ever attended the college. As long as the piece submitted was under 16×20″ it was hung. Needless to say it was a massive show. I visited the intaglio print shop to see the haunt of my printmaking professor Ray E. George. He was a marvelous teacher who has influenced more print makers in the mid-west than anyone else I know. If you showed a modicum of interest he would bend over backwards help you achieve what you wanted from your print making. My Master of Fine Art show consisted in part of prints done with his assistance while we wisecracked through the work. He was a joy to work with. I was grateful to see a plaque in his memory just outside the print shop door. All the print makers he taught remember him with great fondness as do I. No one could have been more devoted to his students than Ray. This young woman can hold an expression for long periods of time, hence the smile. I don’t know how she does it. When I did my self-portraits, I was too immersed in looking at and looking into myself I could never hold a smile without great effort. I have only one self-portrait that has anything but straight face. There is another painting under this image and I had intended to completely cover it but when the fragment in the upper right corner presented itself, I decided to keep it. One of the reasons I keep doing these figure studies is to satisfy my fascination for human variety. So the fragment serves my desire to show and to honor human variety in all its beauty. Unfortunately, we, through the media, do not see a respect for human variety. We see very young, very thin, very fit stereotypes of women and men rather than the reality we have actually surrounding us. Anything deviating from the stereotypes becomes the object of ridicule, humiliation or it becomes invisible. Now that I am a geeza (geezer is the masculine form) I see even fewer people like me in the media. In my own small, imperfect way, I try to rectify that.